You're not going to feel like you're IN the storm watching this film on TV, but it should still pack a pretty good punch on a big enough screen. This is a movie with an ocean of incredibly ominous 80-foot waves in store for its final hour, and in the first five minutes it blows its incidental music wad with overblown orchestration for nothing more than a fisherman returning from sea getting a hug from his girlfriend. Perhaps I'm over-reacting, but nothing frustrates me more than seeing a good movie ruined by its Hollywoodization. So before I blow up again, let me inventory what "The Perfect Storm" does right. The story is, for the most part, about the crew of the Andrea Gail, a fishing trawler that in 1991 was caught off the coast of Massachusetts during Hurricane Grace, which became arguably the 20th Century's most devastating storm at sea after colliding with two other massive fronts. In short, we're talking "Twister" times 120 with monstrous walls of water an no hope of shelter. On board are skipper Billy Tyne (an unglamorous George Clooney, looking convincingly lived-in and well on his way to being an old salt), swording rookie Bobby Shatford (a scruffy Mark Wahlberg) and a small crew of veteran fishermen (John C. Reilly, William Fichtner, John Hawkes, Allen Payne) to whom the audience becomes quickly attached through strong establishing stories that open the film -- notably Bobby's warm, budding romance with an older woman (Diane Lane). The crew has had a streak of bad luck, and they've headed out to sea one last time at the end of the season to make their quota and maintain their dignity. After venturing far into the ocean they score a huge haul of hundreds of swordfish and are heading home when the storm hits. 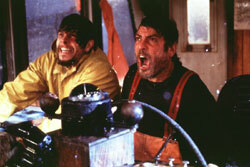 Industrial Light and Magic worked with Petersen to produced astounding CGI effects that transport the audience so realistically into the heart of this angry, heaving ocean that some moviegoers may get seasick. Miles of mammoth waves are visible during lightning strikes that brighten the sky and sea, revealing the severity of the mess the Andrea Gail is in. It's buffeted and battered with relentless intensity. Men go overboard, powerful waves break wheelhouse windows and the vessel overturns and rights itself more than once. But as riveting as these events are, it's during such scenes that "The Perfect Storm" starts to unravel. Petersen cuts away, seemingly at random, to utterly unrelated subplots that, while certainly helpful in illustrating the scope of the hurricane, prove terribly distracting. There's a newsroom weatherman in Boston (Christopher McDonald) who provides a meteorological play-by-play and gives Petersen an excuse to drop in shots of the colossal, spiraling clouds from orbit. There's an intense, water-logged helicopter rescue of a family from their destroyed private sailboat. There are amazing sporadic shots of an oil tanker and a huge cargo ship being tossed around like bath tub toys. I have no qualms with the use of these scenes. They all contribute to what should be the film's mesmerizing spell on the audience. But it's almost impossible to get properly lost in the danger because Petersen can't seem to transition between these episodes without violently jerking out of one story for another. The only cut-aways that work well are the ones that follow the crew's worried families and friends sitting on pins and needles back in Gloucester. Almost as distracting as the bungled editing and the aforementioned unmerciful symphonics is the pathetic prattle these perfectly fine actors are forced to speak. I'm sorry, but there's just no excuse for lines like "You're headed right toward the middle of the monster!" and "I can't make it, cap!" followed by "I'm not gonna leave you here!" This is reportedly a $140 million movie. Couldn't we just once dispense with the dime novel dialogue? "The Perfect Storm" is a wonderfully detailed film, from the mangy look of sailors who've been at sea for weeks to the no-punches-pulled fish gutting scenes to Lane's chipped nail polish and thick-as-"chowdah" accent. The performances are above reproach, especially the still under-rated Clooney and Wahlberg, who has an ability to look courageous and scared to death at the same time. And I think I've made my point about the incredible authenticity of the oceanic effects. If only the soundtrack had shut up for two seconds together. If only the unforgiving life of fisherman wasn't so romanticized. If only Petersen had taken more care in the editing room. If only the emotional finale weren't so profusely mawkish. I might have really liked "The Perfect Storm."